With its rustic, unglazed surface and its moderate shade variation, Jeffrey Court's Stone Wall Tile can be installed alongside stone or ceramic mosaics (sold separately) to create a coordinated look. Recommended for kitchen backsplashes, shower walls, vanities, accent walls. Penetrating sealer must be used prior to grouting. Installing with a white modified thinset is highly recommended. 1 square foot per pack of 3 pieces. Weight per pack of 3 is 7.3 lbs. Buy online Jeffrey Court Creama 4 in. x 12 in. 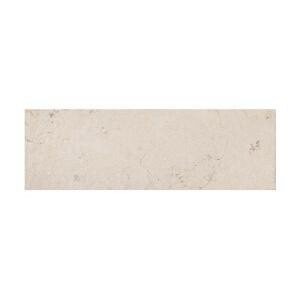 Washed Marble Field Wall Tile 99623, leave review and share Your friends.